Just thought I'd share a few of my Black River Designs projects for this month. I'm in love with this color combo of the green, blue, yellow and brown. I used it on some of my projects last month and, well, I used it here again. I can't help it! I think it is a perfect color combo for those little boy pages. I don't get too many photos of these two together and both looking at the camera so of course I had to scrapbook this one immediately. 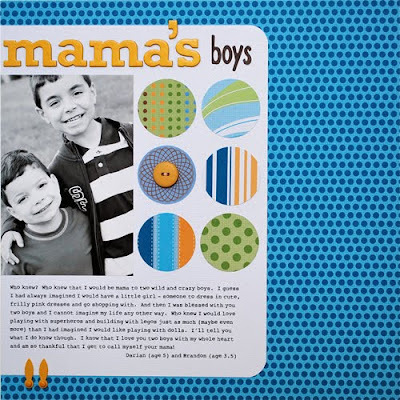 The journaling is about my experience of being a mama two these two boys ... and how much I love it and them! It´s a beautiful layout on your boys. I absolutely love the colorcombo. such a cute photo of the boys! i never seem to get any of my girls together anymore. lol! 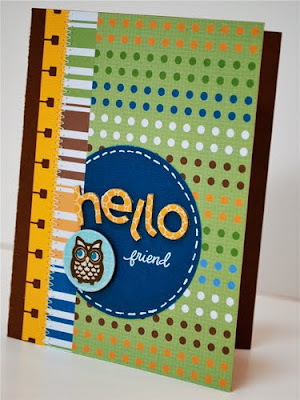 just love the colors of these papers ... great layout!